You could tell by the way she smiles”. We passed “Sam’s Hideaway Tavern” right before we hit the part of the highway heading to Key West known as “The Stretch”. It was not quite 10 a.m. and after a restorative breakfast of ‘Menudo and Corn Tortillas’ at “Rosita’s” in Homestead I was prepared well for a leisurely Saturday drive gazing out over a highway, land and water I first laid eyes on in 1971. Some of the folks of the same vintage as me, from my guess at least, were wheeling their Harley Davidson’s into the short driveway at Sam’s “House of Refreshments”. It might be a while before Sammy unlocked the doors to his place but the bikers would probably not mind. They were not on a schedule nor likely have been since… oh… I’d guess the Watergate break-in or possibly the ‘Death of Disco’. I had to admit that a beer would probably taste great to wash down the spicy-savory Menudo making room in my mid-lifer’s waistline. But I wanted to be alert for any nonsense moves the good drivers I was sharing this stretch of stone might wish to surprise me with. The habit of staying alive is hard-wired in me and even more so now that I’m not only a Papa but a Grandpapa as well. The Keys are wide and grassy when you are still just south of Miami. It looks nearly like a place cattle might graze. But they would starve in the growth afforded this far south. Driving to Key West now is a whole different story than it was in the early times. There is a concrete barrier that probably has saved many lives as the dozing or addled now hit that rather than another traveler heading north or south. And the two lanes of days gone by have expanded morphing to 4 avenues of entrance or egress in many sections to the land we are now heading to after the last bridge over what is called, “Cow Key Channel” and into Key West. But we have hours to go for now. It is a short distance after passing the sign marked, “Monroe County” that the land views of Dade melt into the vast panoramas of The Gulf of Mexico to the right and The Atlantic Ocean to the left. The diamond sparkle light always captivates me and leads my gaze up to a structure that seems almost mythic in the distance. 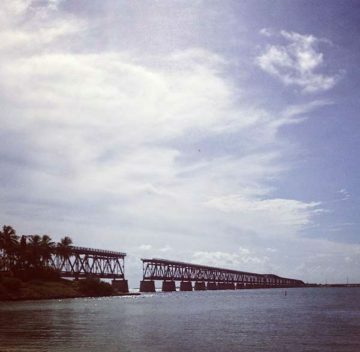 It is the marvel of a soaring, lifting bridge between Mile Markers 109 and 106 over “Jewfish Creek”. And then you descend into Key Largo and the vista shift from Natural Wonders to one of billboards, weekend flea markets, yoga studios, real estate offices, fast food chains, churches of various denominations, Tom Thumb stores, beat barber shops and beauty salons, small banks, auto repair shops etc but because this is the Florida Keys there are the tourist stock-in-trade businesses of tiki bars, places to buy sea shells or obtain a tattoo, fading but still beckoning waterside resorts, R.V. Parks and dive shops. If you want to swim with the dolphins or swill with a ‘mermaid’ you are in the right place. We did not. We had a birthday party for a gal turning 1. So Southward we motored on. “The ghost of electricity howls in the bones of her face”. Her face is Key West and I’m taking us there where a group of us will be howling a version of “Happy Birthday Audrey”.